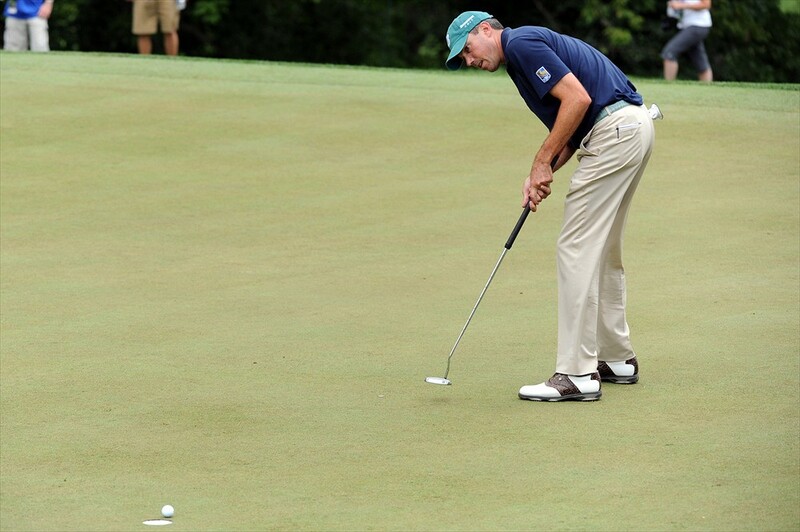 Matt Kuchar doesn't appreciate comments about banning the long putter. Photo copyright Mark Goldman/Icon SMI. Why on the back of the neck instead of the jaw was a question left unanswered, other than Kuchar later telling reporters he had been making an attempt at humor. “It was funny in my mind,” he said just before he happened to see Faldo walking past and hurried over to apologize. That the chronically nice Kuchar reacted in such a way was one of the first signs of a pushback from long putter users in the face of the recent hue and cry about whether the putters should be allowed—including statements by USGA officials that they would take another look into the matter. Some players and others have even called the use of long or belly putters “cheating,” a tongue-in-cheek use of the word since the putters are legal, but one that understandably might sting. The long-putter opposition was inspired by a run of players wielding broomsticks and bellies to win some big tournaments last summer as Adam Scott, Keegan Bradley, Webb Simpson, and Bill Haas all captured titles in WGC or FedExCup events or, in Bradley’s case, a major championship. Here’s the thing, though. Long putters have been around for 26 years and belly putters for 12. After an initial controversy, the USGA ruled in 1989 that “long putters are not detrimental to the game.” So now, after allowing players to use the clubs for almost three decades, the USGA is supposed to decide that they are detrimental after all? Some have argued that the time to act is now that the putters are becoming more popular on Tour and more in demand by consumers in pro shops. No, the time to act was when the putters first appeared. Now it’s too late. I really don’t see how you can tell somebody who has been using the belly for 10 years that it’s suddenly illegal. I don’t like players using their body to anchor the putter. It just doesn’t seem right to use your body to help make a pendulum stroke instead of relying solely on your hands and arms. I would have been inclined to ban the long putter in 1989 or to ban anchoring in 2002. I say “inclined” because on further review there are some arguments the other way that are pretty persuasive when you really analyze the issue. One reason the USGA didn’t ban long putters in 1989 was that they help seniors or players with bad backs. “[Long putters] may enable some people to play who may not otherwise be able to do so,” the organization said in its statement. What about banning them for Tour players? Neither the USGA nor the PGA Tour believes in bifurcation of the Rules. I’m OK with bifurcation, but there are still problems. A simple restriction in length might not work because a taller player who likes to stand upright, even with a conventional stroke, might need a putter that would be so long that a shorter player might be able to use it like a belly (especially if he has a big belly). How about banning anchoring the putter to the body? That’s the real problem, right? Unfortunately, a Rule stating that “the player may not anchor the putter against the body” is too vague. And the more you think about how to word the Rule, and how to enforce it, the thornier it becomes. That’s why I don’t think the USGA and R&A will end up changing the Rule. So, are we close to the end of putting as we have known it? I don’t think so. If it really were such a superior way to putt, everyone on Tour would be doing it. Tour players’ livelihood depends on it, after all, and long and belly putters have been available to them for a long time. They don’t mind looking silly if it helps them make more putts. But Phil Mickelson tried the belly putter late in 2011 and abandoned it. Vijay Singh has continually switched among the long, belly, and short putters. Other players no doubt tried it in the offseason after the success of Bradley, Simpson, et. al. The vast majority still putt conventionally. The long putter might be a better way to putt for some players. But it’s a different technique, and other players are better suited to, or more comfortable with, a conventional stroke. The complaint is that anchoring the putter takes the nerves out of the stroke. There is some truth in that. Charlie Owens, who invented the long putter as a Senior Tour player in 1986, has said that he did so because he had the yips with a regular putter. But critics of the long and belly putters exaggerate when they say it eliminates nerves. Reduces, yes, but it doesn’t eliminate them. And while reducing the effect of nerves, the long-putter stroke may take away some feel. For some, that’s a good tradeoff. For others, it’s not. It is true that the long and belly putter is no longer a refuge solely for the desperate. In fact, Kuchar switched to the belly after 2010, a breakthrough year for him and one in which he ranked 8th in putting with a conventional putter. Last year he ranked 26th in putting with the belly, which, incidentally, he wields differently than most (he doesn’t stick the grip into his belly but lets the putter rest against his forearm). It’s a method he’s committed to—no matter what Nick Faldo, or anybody else, says. And while fisticuffs won’t break out, other users of non-conventional putters undoubtedly feel the same way.